During the month of May, the Friends of the River (FOR) San Bernard Scholarship Committee members Fred Kanter - Chair, Tom Ronayne, Cathy MacDonald, Marie Breakiron, Wayne Head and Barbara Fratila will be awarding six $1,000 scholarships to graduating high school Seniors living in the San Bernard River watershed who have demonstrated a direct connection between their career path and the betterment of the environment. Scholarships pay for tuition, books, and school fees. Mackensi Muzak plans to complete her basics at Wharton County Junior College then transfer to Sam Houston State University to complete a bachelor degree in Pre-Veterinarian Medicine. 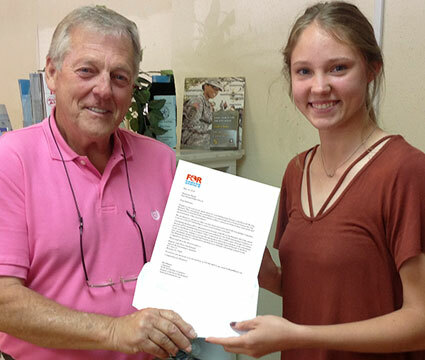 Upon graduation, she plans to pursue employment in the field of her degree which could include vet clinics, animal shelters, zoos, and any other animal related employment. 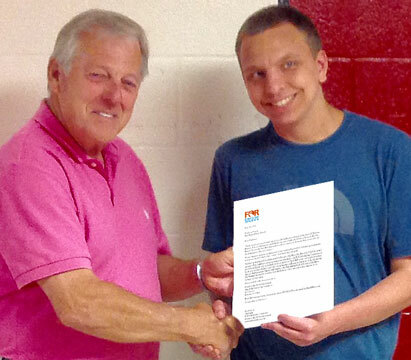 << Past FOR President Wayne Head awarded a FOR $1,000 scholarship to Columbus High School senior Luke Warschak. 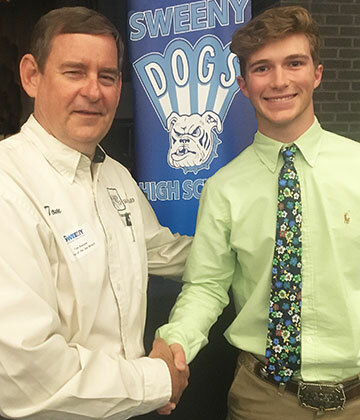 Luke Warschak plans to attend Blinn College in Brenham for a year studying Construction Science then transfer to Texas A&M University to continue his studies toward a degree in this field and eventually gain his Masters Degree in this field. Luke's long term goal is to eventually own his own construction company where he plans to work with engineers and architects with hopes of reducing the release of pollutants. Luke hopes to enrich his community and enhance the betterment of the environment. Hallie Schmitt plans to enroll in Schreiner University in August where she will study Nursing. Her goal is to become a Pediatric Oncology Nurse and work at a children’s hospital in Texas. Hallie is in Medical Terminology and Science Careers Classes and earned her Certified Nurses Aide to help with health programs through her school. 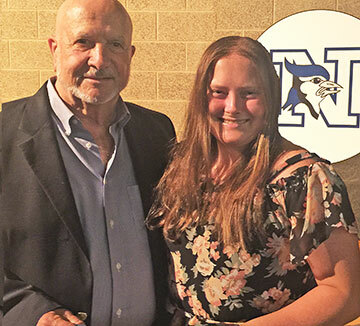 She is an accomplished student and a member of HOSA (Health Occupation Students of America) and a member of the Fellowship of Christian Athletics, which brings us to her other outstanding attribute. Hallie is a varsity softball player and plays select/travel softball with Blaze ETX. She has been named to the Academic All District Team, received the Lean on Me Award with the highest batting average on base percentage and most home runs in a season. Hallie has spent many hours volunteering in her community sharing her time and talents. It is a pleasure for FOR San Bernard to name this accomplished young lady as one of our 2018 Scholarship Recipients. 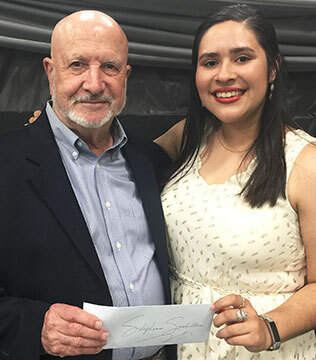 <<< On May 18, 2018, at the Boling High School Awards Ceremony, FOR Scholarship Chairman Fred Kanter awarded Senior Stephanie Santillan a FOR $1,000 scholarship. Stephanie Santillan plans to attend the University of The Incarnate Word where she will study nursing and mathematics and plans to obtain a Masters of Education. She will return to the Boling area to teach, work actively in her community, and be a role model for young men and women “to inspire them to do anything they (can) dream of”. She comes by this commitment naturally as one of her many volunteer organizations is POWER SET which empowers young women to pursue careers in the fields of science, technology, engineering, and mathematics. Stephanie is recognized by faculty advisors to be an active participant, a committed advocate, and an engaging leader. Thomas Campbell, recipient of Sweeny High School's prestigious “All Around Boy” award, will attend Texas A&M University in the fall majoring in Biology. His many accomplishments include earning the rank of Eagle Scout, selection as Academic All-District in baseball and Academic All-State in football, National Honor Society and senior class Treasurer. Thomas volunteered with Sweeny United, Interact, Blue Santa, Sweeny Thanksgiving Feast, his church youth group, and he assisted with other Eagle Scout projects. His ideal career would be a thriving medical or dental practice in his home town of Sweeny. 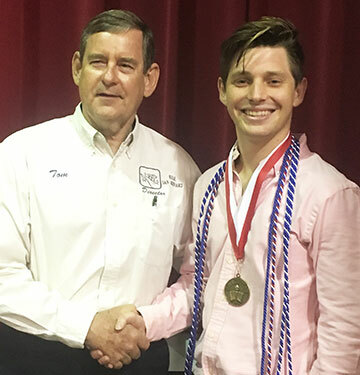 <<< On May 16, 2018, at the Bellville High School Scholarship & Honor Cord Ceremony, FOR Director Tom Ronayne awarded Senior Brian Sifford a FOR $1,000 scholarship. Brian Sifford plans to use his FOR scholarship at the University of Wyoming where he will major in Environmental Engineering. He has earned several other local scholarships as well as two substantial awards from the university. Brian's volunteer activities include Special Olympics, Austin County Fair work and several church youth programs. He is a member of National Honor Society, plays on the golf team, was a Boys State Delegate, and has earned numerous awards through his FFA activities. Brian's long term career goal is to return to Texas and lead his own environmental engineering company.